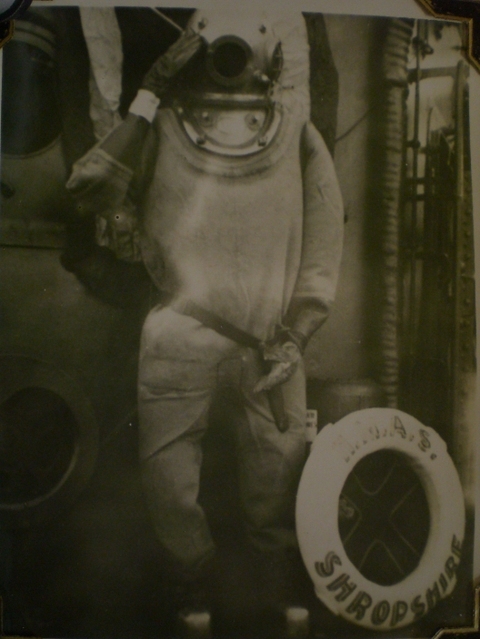 In this rare photograph one of HMAS Shropshire's divers is wearing Siebe Gorman diving gear circa 1944. Siebe Gorman were the preeminent diving equipment makers of the day, and they made a range of different diving helmets which may be basically identified by the number of bolts used to attach the helmet to the collar of the suit. The helmet pictured here is a 6 bolt helmet, and more information about it can be found here. You can read about the Siebe Gorman company and their full range of helmets here. The company is now defunct and their products are much sought after by collectors. For a better view of this type of helmet and suit, here is a modern photograph of WO Glenn Spilsted OAM wearing a 50-year old Siebe Gorman standard diving suit, together with the modern equivalent Mk 27 diving suit worn by WO Eric Johansen. This is the NAVY news article which was attached to the photograph. Here's another charming NAVY news item about the same Siebe Gorman suit, which obviously gets a run on special occasions.